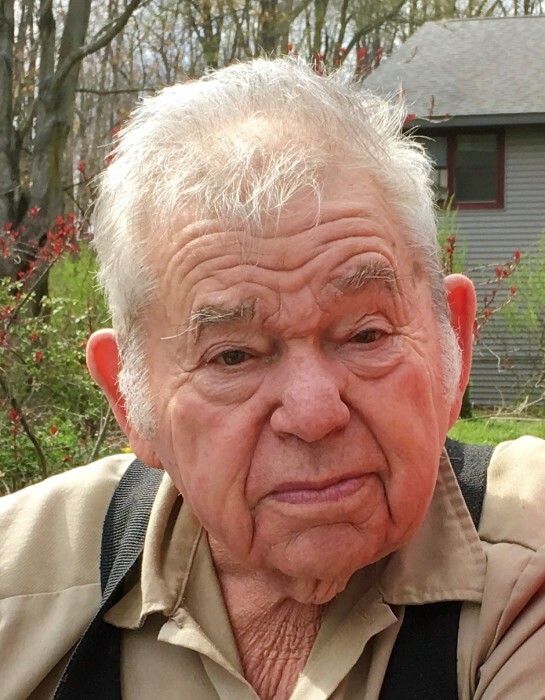 Obituary for James Henry "Hank" Ford | Kaniewski Funeral Homes, Inc.
James Henry “Hank” Ford, 87, of New Carlisle, IN, passed away at 3:45 a.m. Wednesday, February 13, 2019 at West Bend Nursing and Rehabilitation in South Bend, IN. Henry was born on March 9, 1931 to the late John Lonzo and Martha Connie (Stricklin) Ford in Lutts, TN, and has resided in New Carlisle, IN since 1959. He was preceded in death by his two beloved sons, Gregory Lee Ford and James Henry Ford, Jr.; sisters, Net Qualls, Lillie Henson, Mary Scott, Myrtle Mayhugh, and Fannie Ford; brothers, William, John, Robert, Hubert, Vernon, J.P., and Carl Ford. On March 30, 1957, he married the love of his life, Mary Helen Anderson at the New Carlisle Community Christian Church in New Carlisle, IN. Henry is survived by his loving wife of 61 years, Mary; one daughter, Juilann Ford of New Carlisle, IN; two grandchildren, Kelly Ford of Madison, WI; Greg Ford of South Bend, IN; one great grandson, Cameron James Ford of South Bend, IN; three sisters, Romidee Hall of Alabama; Naomi Pfeffer of Toano, VA; Susie Dodd of Savannah, TN; and many nieces & nephews. Henry opened Ford’s Western Body Shop on Western Avenue in South Bend, IN in 1960. He loved cars and especially enjoyed restoring Ford Mustangs with his sons and grandson Greg. For many years Henry was a member of the Western Avenue Business Association, always striving to improve the Western Avenue Corridor. He worked side by side with his son Greg for nearly 30 years before he finally retired in 2007. Henry was a proud sponsor of Maurice Matthys Little League in South Bend for many years, proudly displaying the team’s trophies in his office. He never met a stranger and loved to “sit a spell” and shoot the proverbial bull! He liked to help others and it would be impossible to count the number of driveways he plowed or fenders he painted over the years. Henry was a “jack of all trades” and could fix almost anything. He loved going back home to Tennessee and spending time hunting and fishing with his brothers. Henry had a zest for life and liked to stay busy working in his yard and garden. He loved animals, especially his cat Bojangles and his granddog, Bogie. For the past several years he has been a tireless and loving caregiver for his wife Mary. Henry liked nothing more than spending time with family. He was an amazing husband, father, grandfather, great grandfather and friend. He could also barbecue some pretty awesome chicken on the grill! Visitation will be from 5-8 p.m. Monday, February 18, 2019 at Kaniewski Funeral Home, 201 S. Filbert Street, New Carlisle, IN. Funeral Services will be held at 11:30 a.m. Tuesday, February 19, 2019 at Kaniewski Funeral Home, New Carlisle, IN with Pastor Mary Eileen Spence officiating. Burial will follow in New Carlisle Cemetery. Memorial contributions may be made to Heart to Heart Hospice, 620 Edison Rd., Suite 122, Mishawaka, IN 46545.